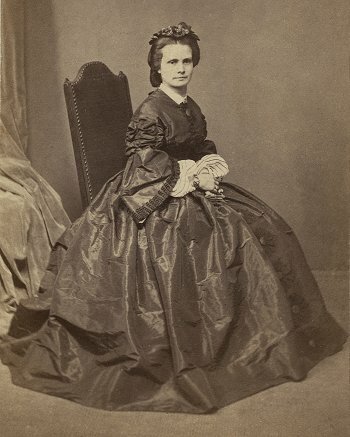 Henriette Dugdale in 1845 (from Wikipedia Commons). AN APPEAL TO MR. HIGINBOTHAM. On May 7 a numerously attended meeting of ladies was held at Ajmere South Yarra, to inaugurate a suffrage society intended to advocate the extension of voting power to women. The chair was taken by Mrs. H. A Dugdale. The purpose of the meeting having been declared it was determined on the motion of Mrs. McKay seconded by Miss Simmons that the association should be called “The Victorian Women’s Suffrage Society.” Mrs. Lowe proposed, Mrs. Ricketts seconded, and it was resolved that all the ladies and gentlemen present should be included in a general committee with power to add to their number. The executive committee was appointed, on the motion of Mrs. Stevenson, seconded by Mrs. Webster as follows:– Mrs. Lowe Mrs. Dugdale, Mrs. McKay, Mrs. Elliott, Mrs. Ricketts, Miss Simmons, Mr Johnson, and Mr Brunton. It was resolved unanimously that Mrs Rennick be requested to act as secretary and treasurer. A committee was then appointed to draw up a constitution and bye-laws for the society consisting of Mrs. Rennick, Mrs. Dugdale, and Mr. Jones. The membership subscription for ladies or gentlemen was fixed at 5s. per year, it being understood that donations would also be invited. Nearly all those who were present became members and paid their subscriptions besides which several donations were handed in and many letters which were read to the meeting expressed sympathy with the movement while regretting the inability of the writers to attend. Public meetings are to be called shortly to invite general co-operation for the objects of the society. Mrs Dugdale-Johnson, who would be better known to Queenscliff’s older residents as Mrs H. A. Dug dale. The deceased lady had reached the great age of 91 years. She came to Queenscliff with her husband, Capt Dugdale, of the ship ‘Duke of Bedford’ in 1853. After having resided here for about 10 years, she removed to Camberwell, where she interested herself in various social reforms; on which question she was the most able lady writer of her day in Melbourne and, -although at times quite against policy, no editor ever re fused her letters or made alterations. She was a trenchant and forceful writer relying upon the justice of all she advocated. Mrs Dugdale took a special interest in the suffrage for women–of which she was the pioneer of Victoria–commencing in the sixties when the whole question was very unpopular, by writing to the papers; afterwards becoming chairwoman of the first Victorian Women’s Suffrage Society. Though age subsequently compelled her to retire from active work, she lived to see the fruits of her pioneer work be come the law of the land. After, Mrs Dugdale married Mr F. Johnson, for many years managing clerk to Lynch and McDonald, solicitors, of Melbourne. After Mr Johnson’s death which occured five years ago, Mrs Dugdale-Johnson again returned, to the old place, after an absence of 54 years, thus passing the remainder of her days with Mrs Jordan-an old friend of over 60 years. Being an invalid, she was under Miss Jordan’s care for the past four years, and her days have been prolonged by the care she has received.